Indandione is a hydrocarbon classified as bicyclic aromatic β-diketone. It can be applied in many fields of science and industry. It is successfully used as a substrate in organic synthesis, pharmaceutical sciences and as a substrate for the production of dyes. Indandione derivatives and analogs are useful in medicine, chemistry and the judiciary. Among the indandione derivatives can find compounds that have interesting properties and many of them have biological activity (incl. anticancer, anticoagulation, anti-inflamatory, antimicrobial activities). Based on the indan-1,3-dione structure created acetylcholinesterase inhibitors. Indan-1,3-dione derivatives are also used as a derivating agent for the analysis of fatty aldehydes and a substance that is an element of dye-sensitized solar cells. This work presents a brief overview of construction, properties and activities of indandione and its derivatives. 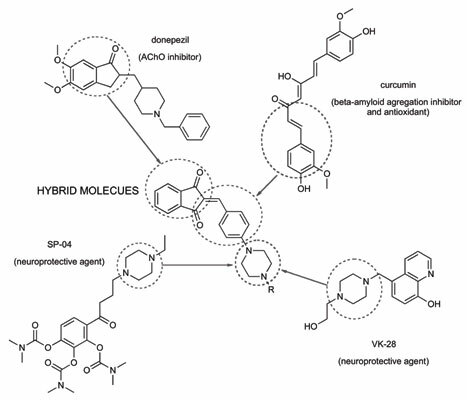 This work describes selected indandione derivatives that have properties useful in medicine and industry with particular regard to the anticoagulants and neuroprotective activities in AD. Indandione, synthesis, anticoagulant, drugs, hybrid drug, derivatives, analogs, polymers.